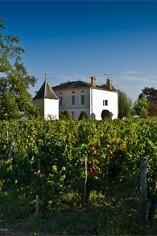 Château Quinault l'Enclos is now unquestionably one of the star estates in St-Emilion. It is a St-Emilion Grand Cru property and is owned by Dr Alain Raynaud and his wife Françoise with cult oenologists, Michel Rolland and Denis Dubourdieu, acting as consultants. Quinault l'Enclos's spanking new cuverie and chai are located in the heart of the town of Libourne with the 18-hectare vineyard being very close to the Pomerol boundary. The average age of the vines is high (60-70 years) and the wine is now a blend of 80% Merlot, 10% Cabernet Franc and 10% Cabernet Sauvignon. Quinault l'Enclos is matured in 100% new oak barrels for 18 months and is bottled unfined and unfiltered.